or Golden-cheeked Warblers, it’s your choice! in Central Texas, offers visitors the opportunity to “rent-a-ranch” for a while, for photography, birding, or just relaxing. The 400-acre property features limestone bluffs, Little Bee Creek, open pastures and hilltop vistas stretching beyond the Colorado River. Ranch owners Julie and Mike Murphy converted the property to wildlife conservation in 2000, and have managed it since then to improve habitat for turkey, quail and other species. At least 6-7 pairs of Golden-cheeked warblers nest on the property every spring; and with luck, ranch visitors can observe this beautiful endangered species. Overnight lodging is in the Casita, a small stone guest cabin built in the 1940s. It will comfortably accommodate a couple, or small family (using a cot or two). It has a small kitchen, wood-burning fireplace insert, AC and is within easy walking distance of Little Bee Creek. 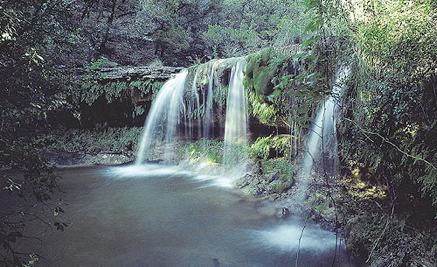 Nearby natural attractions include Reimer’s Ranch (4.2 miles), Hamilton Pool (4.9 miles), Westcave Preserve (5.4 miles), and Pedernales Falls State Park (27 miles). Please feel free to contact us at 512.264.1741, or via email using the button below.